In May 2010, Esquire Bank announced the execution of an exclusive agreement with the New York State Trial Lawyers Association (NYSTLA), which names Esquire Bank as NYSTLA's "Bank of Choice." 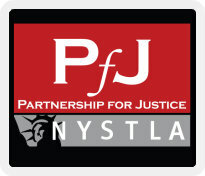 NYSTLA members enjoy exclusive benefits from this relationship. Members have access to business products and services at pricing exclusive to NYSTLA members. You will also have access to co-branding marketing opportunities. Enjoy a classic private bank experience. Members are treated like valued clients rather than customers—a practice long forgotten by "too big to fail" banks. For over 55 years, the New York State Trial Lawyers Association has worked to protect New York's civil justice system, fighting against legislative initiatives that threaten to limit the rights of injured consumers. These threats now exist at the federal, state, and city levels, making NYSTLA a crucially important voice for the voiceless. NYSTLA's mission: "To promote a safer and healthier society, to assure access to the civil justice system by those who are wrongfully injured and to advance representation of the public by ethical, well-trained lawyers."